The most common being that we want to draw fish into the area and hold them so that we have a chance of them picking up our hook-bait. Yes, this is indeed the case, but taking it one step further we have to look into what actually happens when fish (more than one) either ‘come across’ or are ‘attracted to’ the bait that we have distributed. In an ideal situation (which we hope you have all experienced) the fish feed in a very competitive nature meaning that their guard is lowered because of the natural 'greed' factor kicking in. Basically, an instinct with the fish not wanting to ‘lose out’ to other fish cleaning up the food before them. This is the situation that is ideally created in match or competition fishing where a good number of fish can be captured in a relatively short period of time. Obviously, the fish have to be present or drawn into the swim but once there, the correct baiting approach needs to be followed to create the maximum ‘competition factor’ amongst the fish. From our own experiences, we have found that 'area baiting’ works incredibly well. Let’s look at this for a moment in comparison with a 'tightly baited spot' approach such as a PVA Bag. Our own theory on this is that there is far more opportunity for a single fish to clear a tightly baited spot much more quickly thus depriving other fish of the opportunity to get on the bait.... you’re likely in for one run and one fish unless you bait up again also... something to be considered maybe? An excellent approach in many situations, however not necessarily practical if there are many fish present and you wish to maximize your chances of catching more than one fish. With an area baiting strategy, we take something the size of say a tennis court and throughout the entire area bait is scattered both in tight spots and also in a random nature, but covering the entire area. This will create a few positives for you the angler. If one fish is drawn into the area he has a very high chance of finding your bait, getting a taste for it and staying in the area giving you more of a chance that he will come across your hook bait. You may want to take the entire area and break it up into sections. If you have a large area to cover you may want to group together a few 'tennis court ' sized areas... maybe 4 or 6 and take the approach another step by treating each section as a separate entity. What we mean by this is that you could have just one section that was pre-baited purely with particles.... say for example maize or maybe a flavor of boilie that you want to try against an already established bait. Your approach to breaking down the sections is limitless but we have found taking something the size of a tennis court or other familiar sized entity will help you to visualize where the sections of water break down in front of you as opposed to being overwhelmed with a too large expanse of water. It's also a good idea to pick markers on the opposite bank, such as trees for example, to aid in this... again the use of a diagram may be of help to you. The Carp will realize there is more similar food items present as they will come across it, get a taste for it and if it’s any good they will continue to search out for more of the same. If the food source isn't any good believe us, you'll know it, you'll maybe pick up one or two fish at the most before the fish move on. Quality baits will ensure the fish stick around to get more of it. As the Carp browse, as in the diagram above, they will find that there is quite a bit of food around as they are constantly coming across either lone baits or small piles of bait. The chance of them moving out of the swim at this point is very slim. There’s food right under their noses wherever they swim. They are eating machines and if the opportunity is presented to them that is exactly what they will do. So, we then have maybe one or two carp with their heads down 'grazing' and they are coming across bait in quite a large area... They find there seems to be quite a bit of it wherever they go (we've often seen Carp 'about face' when coming to the edge of a baited area and with a flick of the tail get themselves back in the feeding zone pretty quickly) and so after years of fishing and observing the Carp's typical feeding behavior, we think that their instinct is to find the other bait in the area (the last 5 minutes has proven to them that there is more to be had if they search for it). This can and will encourage other fish to enter the area also. We believe that the carp will ‘hear’ others feeding and if hungry, investigate the commotion ‘heard’ through the water, which as we know acts as an amplifier. In our baiting scenario, here, their pharyngeal teeth crushing some hard boilies and/or grinding on our scattered bird seed bait maybe the reason other fish will investigate the area, along with any other disturbance caused by the feeding fish such as the discoloration of water due to sediment being disturbed. This in turn will perpetuate the situation to another level. It just screamed big carp to us!! We randomly scattered CSL pellets, correctly prepared maize, wild bird seed, hemp and a few top-quality boilies over the entire area for a session the following day. The occasional small pile and then a lone bait etc. See map diagram above. The next day we were fortunate enough to have the session of a lifetime and Sean was lucky enough to catch a couple of Ladybird Lake's (Town Lake) Royalty... Find a copy of the American Carp Society's 2005 release, "Town Lake" DVD for complete coverage of this amazing session. We firmly believe that the 'area baiting' approach helped here immensely... we caught a great many fish over a 12-hour period that were not going to move from that spot for love nor money because of the baiting strategy that was used. The fish were spread out enough so that the carp being caught did not spook the rest of the shoal in any manner. There was a definite competitive feeding situation happening... the entire session counted for 2 forties and countless upper twenties and thirties. We did top up the swim from the bank after each fish captured with boilies from a throwing stick, which seemed to really work a treat. So, in closing, this approach has worked for us many times over the years and we can highly recommend this approach for a lengthy session. 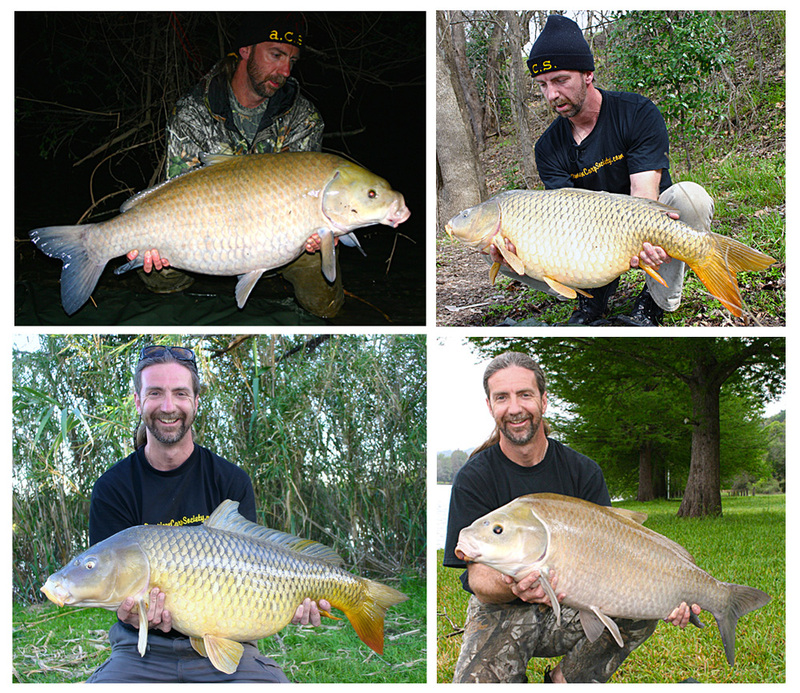 We think you'll find that you will maximize the pick-ups by carp in the area and create a situation where they are feeding with much less caution than if you are feeding over a tightly baited area. It’s not the best way to approach a swim if you only have a few hours because you may only get the chance for one fish in that period so a PVA bag or a method ball would maybe be a better choice. But if you ever come across a swim that just has that 'feel' about it you may want to try the area baiting approach.